Robert Ross was Major of a detachment of four companies of marines that sailed on the First Fleet ships. Marines aboard the Prince of Wales were 2 lieutenants, 3 sergeants, 2 corporals, 1 drummer, 24 privates, some accompanied with wives and children. Private Marine Thomas Chapman was attached to the 60th (Plymouth Company). On 17 August 1787, Sergeant of Marines James Scott also on Prince of Wales wrote, Private Thomas Chapman was promoted to Corporal to stand in for one who had lost his rank on Clark’s ship. In Port Jackson he served in the company of Captain John Shea. Accompanying Thomas on Prince of Wales were his wife Jane, (or Janet), and daughters Elizabeth and Jane Chapman. Their family increased with the birth of Maria, born in the colony and baptised 11 April 1790. 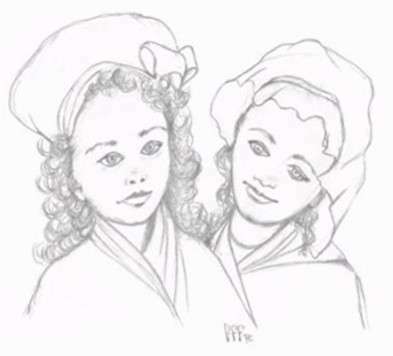 On 23 August 1789, Elizabeth (or Betsy), at 8 years old, went walking after dinner with Mrs Kennedy to Mrs Thomas’, as they were going to borrow a couple of saucers and cups. On the way, they met up with Betsy’s little sister Jane who told her Marine Henry Wright, (a married man with children), had some flowers for her. Mrs Kennedy gave her leave to go to Wright’s house. Wright alone in the house when she arrived, did violently and feloniously attack young Betsy. The criminal court was assembled on 10 September for the trial of Henry Wright. The distraught mother listened as Elizabeth was questioned. She told the court she knew about truth and untruth and that she could say the Catechism and Lord’s Prayer. The court on hearing all the evidence sentenced Wright to death, reprieved to transportation to Norfolk Island for life. Circumstances in the families’ housing improved when Lieutenant Ralph Clark sailed to Norfolk Island aboard Sirius on Saturday 6 March 1790. Clark’s journal for this date, I have left my house in the care of Sergeant Chapman with liberty to live in it until my Return if ever I should wont it. The fitted out troop ship Gorgon arrived in Port Jackson on 21 September 1791, with six months provisions for the colony, 30 convicts and the returning Lieutenant Governor for Norfolk Island, Philip Gidley King. On Sunday 18 December 1791 Gorgon departed for England, with the last company of the NSW Marine Corps. The marines and their families included Thomas, Jane, Elizabeth, Jane and Maria Chapman. Watkin Tench also on board said we hailed it with rapture and exhilaration. Gorgon arrived at Portsmouth on 18 June 1792.